'Wish I knew who to credit with this: 'What the cardinals are looking for is Jesus with an MBA'.' So tweeted the ABC's Lisa Millar, waiting in the 5000-strong media pack outside the conclave that has just ended. Whether Jorge Mario Bergoglio quite fits that description may be doubted. A newly elected pope who chooses Francis as his reign name doesn't exactly evoke images of slick corporate CEOs and Harvard Business School-inspired modern managerialism. And who would want a pope who conformed to those images anyway? But for all its glibness, 'Jesus with an MBA' was a clever line and whoever coined it deserves a credit. It pithily summed up the perhaps contradictory qualities the cardinal electors were seeking among the papabile: genuine humility and pastoral sensitivity, combined with the courage and intellectual acuity needed to clean up the muddle and corruption that have mired the Roman Curia. The Vatican Bank, at least, really needs a dose of managerialism. So the world's news outlets gleefully seized on the phrase 'Jesus with an MBA' and ran with it. It was far from the silliest line churned out of Rome during the past fortnight, as the media cranked up reporting of what the cardinals were doing and saying, while the Vatican tried to muzzle anyone resembling a reliable news source. The result of the Vatican's efforts, predictably, was that unreliable news sources, peddling lurid, bizarre and uncheckable stories, often got a run they did not deserve. The media abhor a vacuum, and thus we got to hear about, among other things, the cabal of anonymous gay clerics who are allegedly at the heart of the Vatileaks and banking scandals. UFOs and monsters from space didn't appear in these stories, but if the Church had endured another week of sede vacante they probably would have. There was plenty of serious coverage, too, of course, much of it drawn from the reportage of veteran Vatican watchers like The Guardian's John Hooper and John Allen of the US National Catholic Reporter. They were obviously talking to cardinals and curial officials who weren't supposed to be talking to them, and from those forbidden chats a more or less consistent narrative emerged, which was picked up by rest of the world's media. This shared narrative rested on several assumptions: that there was no single frontrunner among the papabile, so the conclave would be a long one by modern standards, perhaps up to five days; and that the cardinals had divided into two camps — those demanding drastic reform of the curia, who favoured Angelo Scola, the Archbishop of Milan, and obdurate curial defenders, who preferred the Archbishop of Sao Paulo, Odilo Scherer. This narrative had plenty to commend it to those who had to do pieces to camera or file regular updates for the 24/7 news cycle. It allowed them to portray the conclave as a two-horse race, just like the election campaigns more familiar to many of their audiences. It had an element of surprise about it: counter-intuitively, the structural reformers were backing an Italian, whereas the champion of the old guard hailed from the New World. The narrative could be tweaked in various ways for the next story or bulletin: What would happen if neither man could get the necessary two-thirds majority? Who might the cardinals turn to as a compromise? And, leavening the mix, were plenty of lighter stories about the quaintness and drama of it all: how the black or white smoke would be made, what the new pope would wear, etc. The narrative was speculation. And it turned out to be wrong. It did not take five days to elect Francis I, which strongly suggests many of the electors entered the conclave with the name Bergoglio on their minds. This should not have surprised seasoned political reporters among the unprecedentedly large media pack. 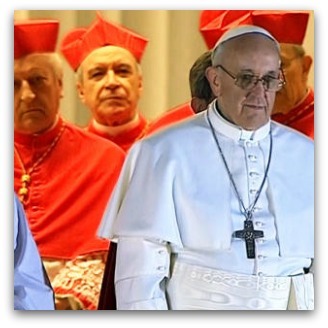 What did they think the cardinals were doing in those preliminary meetings before the conclave? Caucusing, of course, though that is supposed to be forbidden, too. But the media had a narrative, and they stuck to it. The coverage of the conclave was a microcosm of the gulf that, all round the Catholic world, divides Church authorities from journalists wanting to report on the Church. The former still routinely perceive the latter as hostile, just because they ask questions. And the walls of silence that are too often erected in response to those questions are taken by journalists, fairly or not, as an indication that the Church has something to hide. After Benedict announced his resignation, high among the qualities touted as desirable in his successor was the gift of being a good communicator. We'll know that Francis has that gift if the walls of silence start coming down. That's all very well, Ray, but what's in the Two Red Books? The contents of the Two Red Books has had a powerful influence on the mood and voting patterns of this conclave. Bergoglio is almost certainly not named in the Books, but what if he was? It would be all over the internet inside a fortnight. Interesting piece. It added to my intrigue with (and some enjoyment in) the level and type of media interest in the whole papal selection business - including 7 morning TV, and the ABC - from many angles. That aside. My favourite response so far has been from an African-born door-to-door distributor of free power boards in my street, who today was thrilled when he learnt that he and the Pope share the name Francis. He said 'praise the Lord' and wanted to go home to tell his wife. Amazing how it matters in so many ways. The media buzzwords very soon became "humble" and "humility", repeated endlessly on radio and TV. I did wonder--my brain twisted by a certain James Aloysius Joyce--whether Jesuits were famed for humbleness? ROSS, I can't see your connection with James Joyce. He wasn't a Jesuit any more than I'm a Presentation nun. From Ellmann's biography of JJ: ""The children were not sent to school at once, but eventually John Joyce, with the greatest reluctance, sent them to the Christian Brothers' school on North Richmond Street. James Joyce chose never to remember this interlude with the Christian Brothers in his writings, preferring his hero to spend the period in two years of reverie..... It was Joyce's one break with Jesuit education, and he shared his father's view that the Jesuits were the gentlemen of Catholic education, and the Christian Brothers ('Paddy Stink and Micky Mud' as his father denominated them) were its drones." I'd hazard that he would have been pleased with Pope Francis' elevation. My apologies Aurelius, nothing personal was meant. I was just alluding to my limited knowledge of JJ and the Jesuits as the connection was sought. All rather irrelevant to this discussion on my part. There is a study, "James Joyce Among the Jesuits" by Kevin Sullivan, Columbia University Press 1958 so brighter minds than mine have asserted a link. Thanks, Ross. I am striving hard during Lent to minimise my adversarial tendencies and see the positive in people's comments rather than looking to fault. I think it's an important attitude now that the new Pope represents real hope for the church and already inspired me to find a way to get re-involved in the Catholic Church after some lapse. If Ray Cassin were to explain what his "sede vacante" means it might be possible to comprehend what he is talking about. Sede vacante From Wikipedia, the free encyclopedia Sede vacante is an expression, used in the canon law of the Catholic Church, that refers to the vacancy of the episcopal see of a particular church. It is Latin for "the seat being vacant" (the ablative absolute of sedes vacans "vacant seat", and/or the Italian for the same term), the seat in question being the cathedra of the particular church. Free speech is not at risk, and the media companies know it. Their real fears concern the proposed Public Interest Media Advocate's task to determine whether future mergers and acquisitions are in the public interest. The outcry is motivated by self-interest, not concern for the rights and freedoms of citizens.